For the second consecutive year, IKEA sponsored a student competition for second-year BBA students in the Lazaridis School. Titled the IKEA Sustainability Challenge, the competition was founded by Lazaridis School alumnus Mike Ward (BBA ’86), director of North American and Nordic operations for IKEA, and Laura Allan, an assistant professor at the Lazaridis School. Students worked in small teams to come up with the most innovative solution to IKEA’s question. Students met with IKEA executives, visited an IKEA store, and created a video as part of the competition. Five finalist teams pitched their ideas to IKEA Canada executives on Dec. 2. 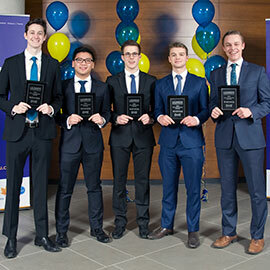 The Palm Oil Substitution Project, comprised of team members Spencer Barnes, Jake Fell, Matthew Imrie, Triet Nguyen and Zach Wilson, won the competition. Their idea was to produce yeast oil to replace palm oil, which shares its unique qualities but doesn’t have specific climate requirements and uses 100 times less land. The team proposed it would connect consumers with what they care about and weave sustainability into the supply chain, addressing the competition’s challenge of closing the loop on the circular economy. Carbon Glass – that takes carbon waste from production and uses it to create new products to replace traditional glass ones. Other judges included IKEA Canada’s Deputy Country Retail Manager Liz Wilson (BBA ’87, MBA ’94), Corporate Press Officer Stephanie Harnett and Robin Laporte, CEO and climate change strategist for Neutopia ecoSOLUTIONS. Students on the winning team will be invited to interview for a summer job with IKEA Canada focused on business sustainability. They will also present their idea to the IKEA Canada Sustainability Forum and have lunch with IKEA Canada’s Acting President David McCabe.